To its credit, the game does an impressive job matching various brain exercises and activities to the different eras of life that it represents. Unfortunately, most of those periods are prehistoric, which means you’ll spend the bulk of Time Warp fighting for survival or drowning. That’s just not as compelling. The Time Warp of Dr. Brain is much lighter on story than its predecessors. A quick, 30-second cutscene at the start explains that Dr. Brain lost his car keys somewhere in the space-time continuum and, in an effort to find them, malfunctioned and became stranded in the past, present, and future. This is all the story you get; for most of the game, Dr. Brain stays out of sight as a loudspeaker that barks instructions and occasionally heckles you. Frankly, I enjoyed that the game speaks for itself. The lack of zany cartoon antics and the minimalist interface give the puzzles some breathing room that they occasionally needed in Lost Mind. The puzzles are appropriately a little more involved, even if they err from the conceptual level that made Lost Mind such a success. 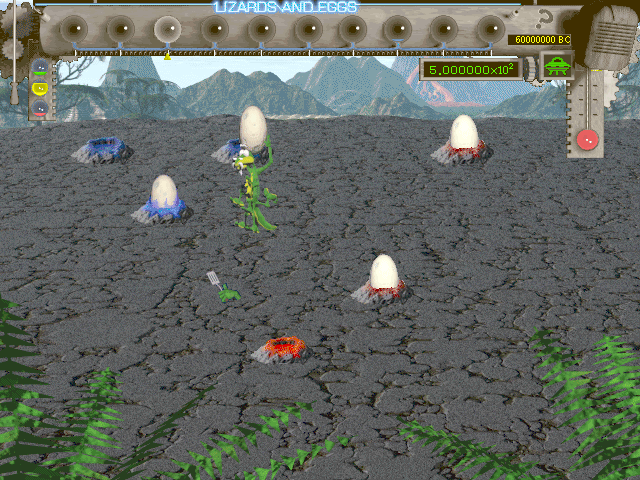 Four of the minigames are set before humankind evolved, so they rely much more on fight-or-flight reactions than applied logic. 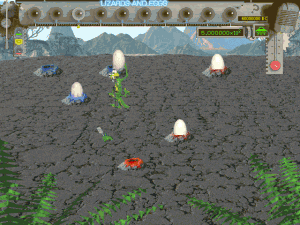 One set in 999,000,000 BC, for example, is a real-time strategy game in which you control an army of single-celled organisms. Another casts you as a beaver forced to rebuild a crumbling dam. More logical puzzles appear later on, such as a complicated traffic management sim and a few upgraded repeats from the previous game. In a way, the change is brilliant. Time Warp intentionally downplays the latent educational skill aspects that took once center stage in favor of a new thematic structure. 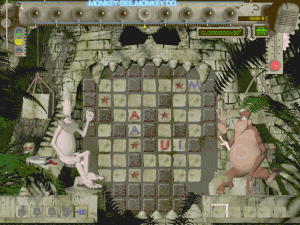 Just like Lost Mind used the brain as a level selection device that represented the cognitive themes of the game, Time Warp uses the timeline as a navigation screen that represents the evolution of life. And while the previous game subtly taught skills from each zone of the brain, this one lets players experience how life may have been (or will be) during each stage in history. These tweaks play with the Dr. 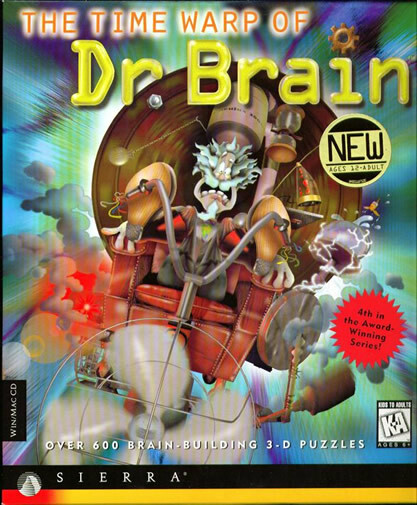 Brain structure in inventive, unexpected ways, so credit to the game for refreshing the formula with a new subject. But the new puzzles… well, aren’t as much fun. The logic games accounted for most of Lost Mind‘s appeal, and the faster-moving bits tended to be less appealing and bogged the game down. Now those action-oriented games make up roughly half of the available selections. Perhaps this is a nod to Gardner’s theory of multiple intelligences, which the game explicitly employs to cater to kids who learn visually or kinesthetically. Still, no intellectual justification can mask that the Dr. Brain developers could never do action. The “Spelunking” game is a particularly heinous culprit, since it consists almost entirely of navigating long, monotonous mazes in a limited time. Of course you can still play the more interesting, slower puzzles, such as the alchemy game in which you build potions, but far too much of Time Warp is spent on the parts it does least well. The Time Warp of Dr. Brain is good, but it never reaches the same heights as its predecessor. The history-driven approach reinvents old conventions but accidentally tosses out some of the series’s fun, wit, and charm too. Maybe you can blame the barebones presentation or the somewhat grim claymation graphics. Or it could be the overemphasis on fast-paced, non-logical puzzles. Time Warp is still more engaging and entertaining than most educational games, but this one is just missing the spark that made Lost Mind such a rare gem.